Train cars for the Ben Thanh-Suoi Tien metro line in HCMC will be transported to Vietnam from Japan during the first quarter of 2019. The HCMC Management Authority for Urban Railways (MAUR) met the Japan International Cooperation Agency (JICA) and construction contractors in the city on Friday to finalize plans. Duong Huu Hoa, director of the Project Management Unit No.1 under MAUR, was quoted by the Vietnam News Agency as saying that as of late 2018, work on the project was 62% complete, compared with its schedule of being 65% finished. Hoa attributed the lower-than-expected workload to late payments for construction contractors, which had slowed progress on the train line. Also, the coordination among MAUR, relevant departments and agencies was not yet close enough. He remarked that the target for the project’s workload is put at some 80% this year. Some contractors proposed that the municipal Transport Department evaluate the designs for some construction items, so that work on the project could remain on schedule. They also complained that they had not received payments for multiple packages, which caused difficulties for them. Consequently, work on some packages is over six months behind schedule. They have also experienced rising maintenance costs because much imported equipment has not been installed. According to JICA representative Kota Murakami, the metro line project is of paramount importance to the city, so all involved parties should remove such obstacles and speed delivery of construction payments as soon as possible. The JICA recognized the efforts of MAUR in ensuring payments for contractors during past months. Nguyen Van Tam, deputy director of the HCMC Transport Department, stressed that the regulator expects the metro line to be built in a fast, safe and quality manner. However, the department is not the only agency to make evaluations, as the process involves many departments and agencies. He added that his agency will coordinate with other units to come up with earlier evaluation measures. Also, the MAUR should soon inform the transport department and the HCMC People’s Committee of those issues beyond its mandate. The head of the MAUR, Bui Xuan Cuong, said that the project is facing numerous difficulties, especially due to regulatory adjustments. Inspection and auditing results also revealed that many problems have affected the disbursement process of some packages, resulting in late execution. He said MAUR is asking for advance funding for 2019 to make payments to contractors. After the Lunar New Year, or Tet holiday, the authority will quicken the completion of legal procedures in order to speed up the implementation process. Launched in August 2012 as the first line in the city’s metro system, the Ben Thanh-Suoi Tien line will stretch 19.7 kilometers, mostly above ground, and connect the city center with its eastern districts and the outlying district of Di An in neighboring Binh Duong Province. It is expected to begin operations in 2020, two years later than originally planned. In 2009, the HCMC People’s Committee approved the total investment for the Ben Thanh-Suoi Tien metro line at VND17.388 trillion. The fund now has been revised up to VND47.325 trillion (US$2.04 billion). In a related development, the local government on Friday asked the concerned departments and agencies to handle those individuals and groups that were found to have committed bidding violations during the selection of contractors in charge of a bidding package for the design, construction, and relocation of technical infrastructure works under the Ben Thanh-Tham Luong metro line project. 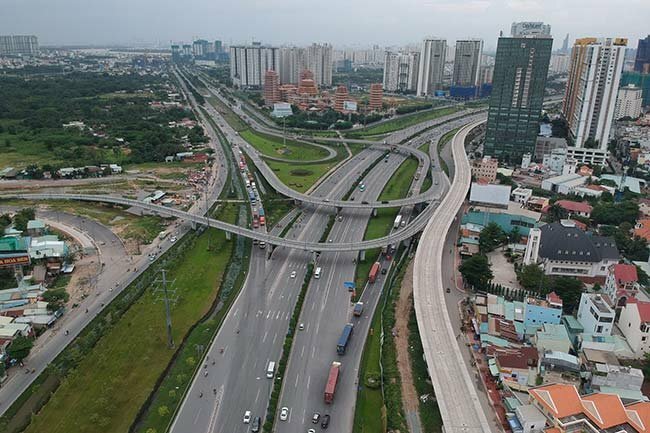 The second metro line, which has yet to be developed, will stretch nearly 20 kilometers and connect Thu Thiem New Urban Area in District 2 and Tay Ninh Coach Station in neighboring Tay Ninh Province. In the first phase, the city will develop an 11.3-kilometer section running from Ben Thanh Market in the downtown area to Tham Luong Depot in District 12, including 9.3 kilometers of underground tracks. Its investment is expected to soar to VND47.891 trillion (US$2.06 billion) from the initially approved tally of VND26.116 trillion in 2010, due to its lengthy preparation period, delays in its execution process, increases in construction workload, as well as increases in prices.